We are committed to the sourcing, preparation and publication of open data. We aim to ensure that all the open data we publish has a minimum 3-star openness rating. Our data must be accessible on the Web in a machine readable non-proprietary format with a licence that permits anyone to reuse it. Click on the data cards below to reveal information about the data (metadata) and preview it in maps and tables. The datasets can also be found on our dedicated repository on GitHub. 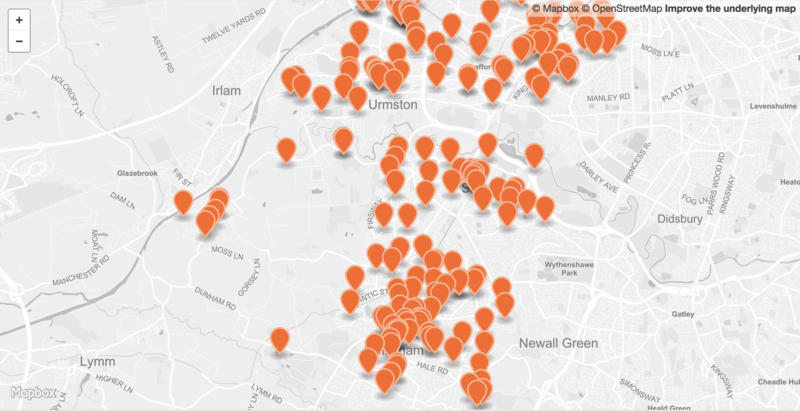 Dataset description Locations of Local Authority controlled Closed-Circuit Television (CCTV) cameras in Trafford. Lab visualisation View data within the Lab's Explore application. 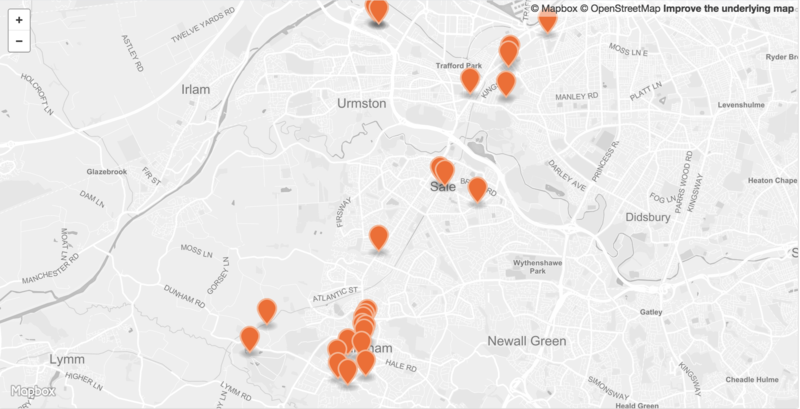 Locations of Local Authority controlled Closed-Circuit Television (CCTV) cameras in Trafford. Notes Please note that these defibrillators may have restrictions on public availability and may not be available 24/7. The locations may not be exact as they are derived from postcodes. Notes The postcodes for each location are linked to coordinates from the ONS' Postcode Directory which contains British National Grid coordinates for address-weighted unit postcode centroids. Notes The addresses were batch geocoded using Google Maps with the ggmap R package. Dataset description Green spaces like playing fields and allotments within Trafford and Greater Manchester. Green spaces like playing fields and allotments within Trafford and Greater Manchester.